South Korea's biggest Buddhist denomination ordered its executive head to step down Thursday amid mounting allegations he forged his academic credentials, accumulated vast wealth, and broke his vows of celibacy. The 56-14 vote of no confidence in Seoljeong, president of the Jogye Order, by its central committee is the first in a history that dates back hundreds of years -- the organisation is believed to have been established in the 12th century. With more than 3,000 temples, 13,000 monks and seven million followers, it accounts for most of South Korea's Buddhists and is highly influential in a country where religion remains a powerful social force. But it has long been dogged by corruption allegations and factional feuds. Many rank and file members and civic groups have staged protests to demand Seoljeong's resignation over the allegations, and a senior reform-minded monk was taken to hospital this month after a 41-day hunger strike outside the Jogyesa temple, the order's headquarters in central Seoul. The order's spiritual leader Patriarch Jinje has also called for Seoljeong's ouster and Buddhist activist Cho Jae-hyun said the order's 24-member Council of Elders was expected to approve the move next week. Pressure has mounted on Seoljeong since a television programme revealed in May that he claimed in his autobiography to have graduated from the prestigious Seoul National University, which the school denies. The broadcast also said he had fathered a daughter in breach of celibacy rules, and owned large real estate holdings despite taking a vow of poverty. Seoljeong, 76, took office in November and denies all the allegations, accusing a Jogye Order "old guard" of seeking to derail his reform drive by framing him. The eight-year term of his predecessor Jaseung -- who backed his candidature and is believed to remain influential -- was also marred by allegations of corruption, gambling and broken celibacy. Reformists have called for a mass rally of monks at the Jogyesa temple next week to press for sweeping changes. 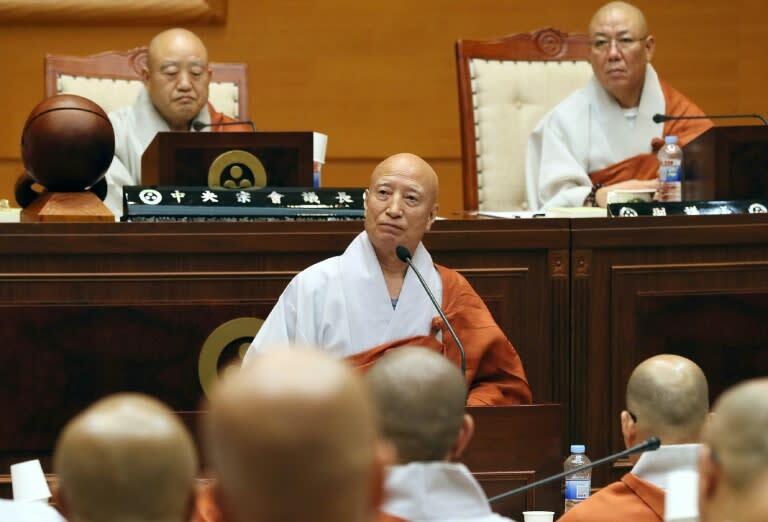 "We call for the resignation of all the old guard, not only President Seoljeong but all the central committee members to pave the way for reform and democracy", Kim Young-Kuk, head of the Buddhism Reform Movement, told AFP. The Jaseung faction was seeking to sacrifice Seoljeong to fend off criticism over corruption, he said. "It's like a lizard cutting its own tail to escape from a predator." In 1994 the Joygesa Temple was the scene of violent clashes between rival factions of monks over control of the order's executive posts, with many monks and riot police injured. Following the battle, the order adopted a reformist constitution but Kim said the drive for change soon lost steam. A 2014 survey by Korea Gallup showed 22 percent of South Koreans identify themselves as Buddhist, followed by 21 percent Christian and seven percent Catholic.